Welcome to the Department of Electrical and Computer Engineering! At the undergraduate level, the department offers degree programs in Computer Engineering and Electrical Engineering. Both programs are accredited by the Engineering Accreditation Commission of ABET. Electrical and Computer Engineers have been uniquely responsible for developing many of the innovations that have brought us modern life. Today, they are urgently needed to help solve a variety of global problems, including challenges related to energy, communications, health care, climate change, and national security. The Department of Electrical and Computer Engineering (ECE) is one of the top engineering programs in the country. At the undergraduate level, the department offers undergraduate degree programs in Computer Engineering and Electrical Engineering. Both programs are accredited by the Engineering Accreditation Commission of ABET. Faculty, graduate students and undergraduate students are working on some of the most challenging and exciting research projects of our time. With approximately 85 full-time and affiliate faculty members, over 1000 undergraduate students, 500 graduate students and over $37 million in research expenditures, the department is one of the most active education and research units at the University of Maryland. Each semester the ECE department hires some of its finest students in high academic standing (3.3 GPA and higher) to serve as Undergraduate Teaching Fellows (UTFs) to lead labs and/or discussion sections for many of its 100-and 200-level ENEE courses. A broad range of student competition teams and research and volunteer organizations empower ECE undergraduates to apply classroom knowledge and hone the skills needed to be successful in the years after graduation. ECE encourages students to study abroad and offers programs designed specifically for ECE students. 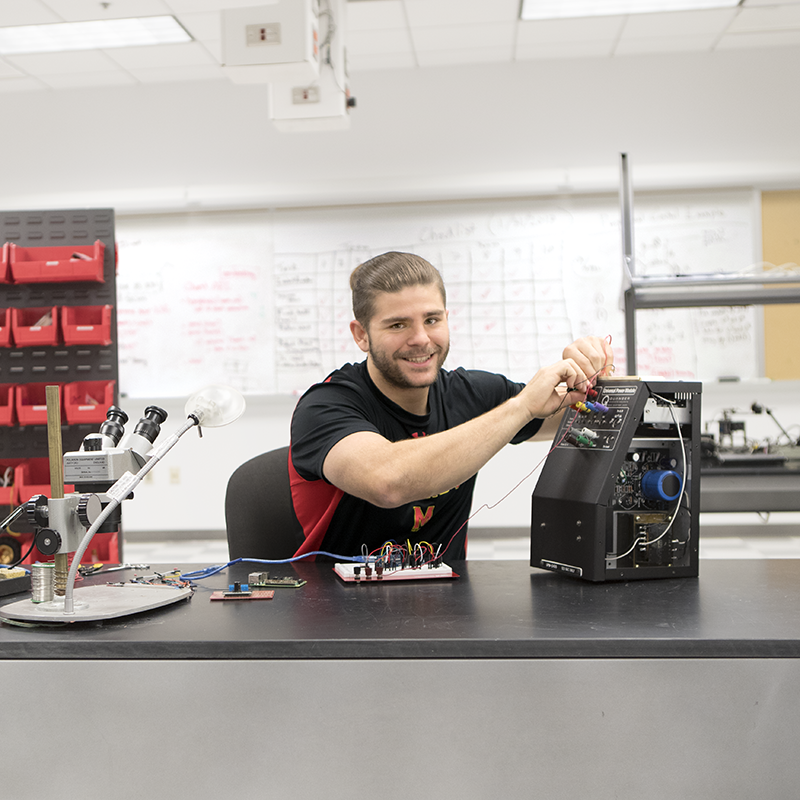 The University of Maryland's promixity to Washington, D.C. offers students unique professional opportunities with leading engineering companies and research labs as well as state and federal agencies. Department-supported activities, such as the ECE Career Fair, enable students to meet industry leaders and hiring managers. For more information please visit the Engineering Career Services website at http://eng.umd.edu/careers. ECE Honors participants are among the most gifted and motivated undergraduate students at the University. Students completing the program courses and research requirements will receive an honors citation on their transcript.